Who knew that such a beautiful and tranquil setting could be found so close to San Francisco?? This is a premium $3 million dollar property. Located just 4 miles from the Golden Gate Bridge, this is a two bedroom, two bath villa in Tiburon Belvedere, with stunning bay and San Francisco city views from every room. Walking distance to the Tiburon Ferry that can take you directly to Pier 39. This property is valued at more than $3 million. The living room features breathtaking panoramic views of San Francisco Bay, Angel Island, and Berkeley to San Francisco. The house is complete with surrounding grounds, including garden and fruit trees. You can harvest your own oranges and lemons. There is a 60 inch TV which rises silently from a hidden cabinet with the push of a button. Living room includes Telescope, game cabinet, piano, and a fireplace with gas starter. Redwood deck overlooking view, with barbecue. Dining room seats eight, has gorgeous views and vaulted ceiling. Gourmet kitchen with granite counters, professional quality gas range, and double wide refrigerator with ice maker, oven, microwave, and warming tray. Kitchen opens to living room and dining room via two sets of French doors. Kitchen has vaulted ceiling with skylight. When we're at home, we love to watch the hundreds of sailboats that race along Racoon Strait, right in front of the house, and the giant tankers and container ships that sail through the Golden Gate. We love walking from the house along the shoreline, to downtown Tiburon. The ferry terminal is right there, there’s no better way to visit San Francisco than by ferry. Tiburon's Main Street, which is a short walk away, is picturesque and quaint, with lots of excellent restaurants. You can also take a ferry boat to Angel Island State Park (the large island that you see in the bay right in front of the house). By car, you can be in San Francisco or the Wine Country in minutes. This house is available for 30 day rentals. We love to travel, and occasionally make our home available to rent when we are away. Awesome views, excellent climate, and fantastic small town with small town feel, great shops, and excellent restaurants, and easy access by ferry to San Francisco, plus close proximity to Napa and Sonoma Valley wine country. The best of all worlds! No wonder Tiburon is some of the most desirable real estate in the U.S. Most vacation rental properties don't provide much in the kitchen, not even salt and pepper, cooking oil, sugar, spices, coffee, tea, rice, pasta, etc. We provide all of these things and more, condiments, sauces, as well as a fully equipped kitchen that has every high-end tool and appliance that a gourmet chef would desire. The cookware isn't cheap stuff, but top of the line cutlery and All-Clad cookware. Even if all you cook is the occasional breakfast, you will be pleasantly surprised how well equipped and stocked the kitchen is. Master Bathroom finished in white marble. Second bathroom finished in travertine and teak and has a curved ceiling evocative of a ship's cabin. Telephone provided for incoming calls and domestic calling. laundry room in the house includes washer and dryer. German made Miele dishwasher has separate silverware rack. Extra large side by side refrigerator with ice maker. Also below the built in Microwave is a slide out warming tray that keeps plates and food hot. kitchen has top of the line stainless appliances, gas stove, oven, microwave, and warming tray, side by side refrigerator with icemaker, dishwasher, toaster oven, coffee maker, coffee grinder, blender, granite countertops, 14 ft. high vaulted ceiling with skylight. Dining room has a table that can seat 8 persons. It is possible to expand this table to accommodate up to 16 persons (please inquire). There is a 60 inch TV (152 cm) which is hidden in a cabinet in the living room. With the touch of a remote control, the screen rises silently for viewing. (1) There is a 60 inch TV (152 cm) which is hidden in a cabinet in the living room. With the touch of a remote control, the screen rises silently for viewing. (2) in the Master Bedroom, a 42 inch TV. iPod dock connected to stereo system. Bring your own iPod. Also Amazon Echo "Alexa" devices provided that can provide music on your command. Pool table located in the covered outdoor patio. collection of kid's videos on DVD. Deck overlooking the view includes teak dining table and chairs (seats 6 to 8), teak lounge chair and rocker. Whereas there is no wheelchair ramp, there is one set of stairs leading down from the parking area to the main level of the house. These steps are sturdy outdoor steps with sturdy, easy-t-grasp handrails on both side of the steps. There are about 12 steps leading down from the parking area to the main level of the house. Once at the main level of the house, this level includes: the master bedroom, master bath, living room, dining room, kitchen, and foyer. There is another level below which includes the second bedroom, second bath and laundry room. Wine Tasting in Tiburon. Also you can drive 45 minutes and you are in Napa/Sonoma valley for wine tours and tasting. Great restaurants within walking distance in Tiburon - Guaymas, Sam's Anchor Cafe, Servino's, Waypoint Pizza, the Caprice, Rooney's, Sushi, New Morning Cafe, and more ..., Live music most evenings at Servino's, Two yacht clubs within walking distance, The Corinthian YC and The San Francisco YC. The view was fantastic, and the walk into Tiburon is short and pleasant. The return walk is uphill but quite manageable. The house was clean and well-stocked, and the owner was very responsive. The area is chock-full of good stores, restaurants, and places to go. Wine country is easily accessible. Our only regret--we had weather that was historically wet and cold! It basically rained for 5 weeks. But the house was very cozy, rain or shine. We enjoyed our stay, and happily recommend the house to others. Thank you so much for the getaway we needed!!! Beautiful home, beautiful views and sweet accommodating owners! We loved the location in Tiburon. So close to the city yet within a lovely neighborhood with beautiful views, quaint town, and comfy beds. We enjoyed cooking in their kitchen with a sweet rustic table for meals shared and games for our family time together. We are musicians and we enjoyed the piano in the living room and the Alexa music system for easy fun mix of music to accompany our time. Thankyou for sharing your home and for being such an accommodating host. You home made our time together very memorable! Thankyou!!! Bruce’s property has sweeping (and spectacular) views of the bay and Angel Island. This is a very welcoming environment that makes you feel immediately comfortable and at home. The very eclectic and spacious interior design is accentuated by the playful artwork throughout. Every room of the home has fantastic views. The wood burning fireplace and telescope were a special bonus that added a new dimension of fun to the nighttime experience. Bruce’s home is centrally located in an idyllic, quiet neighborhood; close proximity to interconnected hiking trails, footpaths, and neighborhood walks. 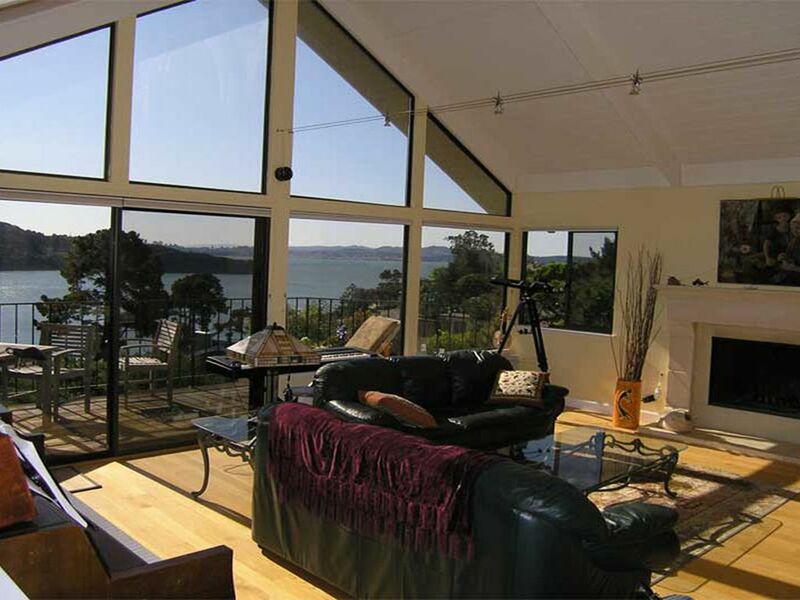 Within walking distance of downtown Tiburon - restaurants, shopping, ferries to Angel Island, San Francisco, or Alcatraz. I highly recommend this property for couples or small families. Thank you so much for your detailed review. Very much appreciated. I hope you may visit again. This property and this location could simply not have been better! The home is clean, very well maintained, tastefully decorated and accessorized, and wonderfully equipped. Add that to its superior location....the view of San Francisco Bay and Angel Island, and the boat traffic (early one evening we spotted FDR's former yacht, the "Potomac" cruising by between us and the Island)....the easy access to two different ferry lines with frequent crossings to San Francisco, both of which we utilized, one for getting us to the Ferry Building and the financial district within which we found many art galleries, the other to Fisherman's Wharf. Tiburon itself is charming, with several quality restaurants and a nice laid-back feel. As I told the owner, the only bad thing was that now we fear we have been spoiled and will not be able to find a place for our next vacation that will satisfy us the way this one did! hi Philip, thank you for your review. I hope to see you again. Minutes from San Francisco by ferry or by car, and in the sun-belt: This part of Tiburon has sunny afternoons while San Francisco and Sausalito are covered in fog. Also a short drive to California's Wine Country: Napa and Sonoma valleys. Close to Muir Woods National Monument, and the beautiful beaches: Rodeo Beach, Muir Beach, Stinson Beach. Majestic Mount Tamalpais, with its breathtaking views of the entire San Francisco Bay Area, is a short drive away. The idyllic Town of Tiburon is a tourist destination in itself: quaint shops and chic restaurants along the historic waterfront and Ark Row. The ferry from Tiburon to San Francisco, Fisherman's Wharf, and Angel Island are all a short walk away. Golf: Very many world class golf courses in this area! All major credit cards accepted. THE FINE PRINT: PLEASE READ THIS SO THAT YOU UNDERSTAND OUR TERMS. 1. The cleaning charge is a deposit. This should be sufficient to pay for the normal housekeeping. If however you leave the house in a condition so that more than the usual hours are required, your credit card may be billed for the additional hours. 2. You will be asked to provide a copy of your photo ID via email or fax. 3. This house is available to Travelers from outside the local area only, NOT available for rent to residents of anyone within the general vicinity of the San Francisco Bay Area, with the exception of local Tiburon/Belvedere residents who need additional guest lodging for themselves or their family members. This house is also NOT available for weddings, parties, receptions, or any type of social event or commercial use. 4. We reserve the right to conduct a credit check. Your application to rent this house may be denied if we deem your credit rating unsatisfactory.